What we have today is the post-hype sleeper. Not every prospect avoids all trouble as he climbs the minors. Some have injuries that push them back or simply running into a wall. Omar Poveda just completed his first year in the Braves system. It might be his only one, unfortunately, but he was a solid, dependable pitcher for the Gwinnett Braves and if the Braves had the available room, he might have even earned a call-up before the season comes to a close. Poveda was born on September 28, 1987 in Venezuela. That day in Cincinnatti, the Braves would fall 6-5 to the Pete Rose-led Reds despite a 3-for-4 day from Gerald Perry. Second-year shortstop Barry Larkin hit a three-run homer that would eventually account for the difference. However, if Poveda emerged from his mother’s womb the previous day, he would have born on the day of Phil Niekro‘s final game. Random, I know. 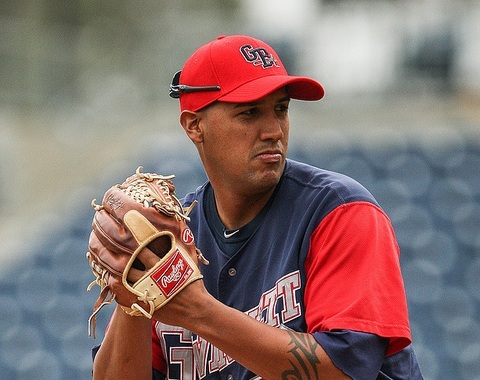 After joining the Rangers’ organization as a teen, Poveda quickly made his state-side debut in the Arizona League Rangers in 2005 while just 17. He was only 18 when he debuted in A-ball the following season and more than held his own while striking out 134 in 154.1 innings (7.8 K/9). Despite his success, the Rangers held him back a year and he repeated the level with even better results. His 2008 season was wrecked by injuries, limiting him to just 17 starts at high-A, but he bounced back in 2009 when, at the age of 21, he posted a 1.39 WHIP at AA. He even made his AAA debut and was considered to have a chance, though not a great one, to make the team for 2010. However, he hurt himself early in spring training and needed Tommy John surgery. Not exactly the season he was hoping for. Half-way through the year, the Rangers traded him to the Marlins for Jorge Cantu. For two seasons, he struggled to put up consistent numbers with his new organization, but after struggling badly in 2012 between AA and AAA, the Marlins out-righted Poveda and he became a minor league free agent. That said, Poveda did have a good season. As far as I know it, he throws both a two and four-seam fastball to go with a plus curveball and a good change of pace. He’s major-league ready, but will likely need a good deal of luck or a development of a new grip/pitch to succeed in the majors. If the Braves can clinch NL’s best record, maybe they could make some room for Poveda to get a start. Would be a nice gift after the season he had for Gwinnett.